Lovely Pearl ring features a pass design. 14k Gold ring holds two 6mm round freshwater pearls set in this unique by pass design. Customize this fantastic design with black or Akoya pearls. 14K Gold and 6.5mm Pearls create this ring. Incredible design 14k White or yellow gold ring holds a 6.5mm round freshwater cultured white and black pearl accented with 1/10ctw diamonds. You'll love this ring. 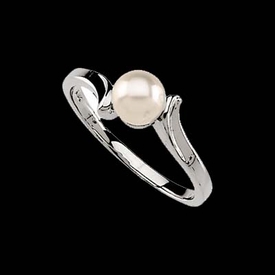 Dainty 14k Yellow or White gold pearl ring. Cultured pearl measures 5.5mm round in this gold ring. Black Pearl Ring. 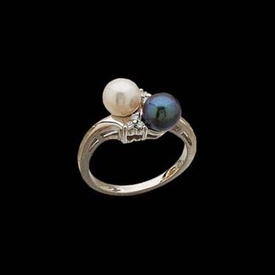 Pretty 14k White gold black pearl ring. Freshwater cultured black pearl measures 6mm round. Stock size 6. We are happy to size this ring for you but sized items take an additional 4-5 days before shipping and are custom non returnable. 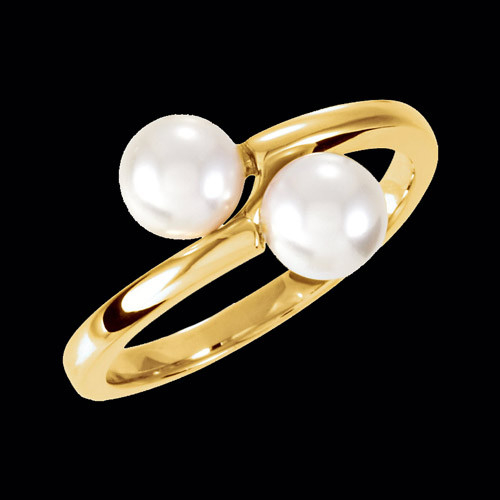 Lovely 14k Yellow gold and South Sea Cultured pearl ring. South Sea Paspaley pearl measure a bold 12mm. Incredible pearl ring. Pearls are uncommon gems created inside one of the simplest organisms in the universe: the oyster. According to American Museum of Natural History, human fossils from the Persian Gulf region show people buried with their right hand pierced with a pearl. Because of its humble origins and rarity, the pearl has become the symbol for purity and sophistication. The Far East was the first geographical region encapsulated by pearls. In Hindu and Muslim traditions, wearing pearls is a status symbol for royals and other leaders. For Muslims, the pearl symbolizes attaining perfection and completeness. For the Hindu, pearls represent the celestial moon. In China, pearls are famous as the main accessories of members of the Qing dynasty, which ruled from 1644 until 1911. The emperor of said dynasty was so picky about his pearls that he insisted on freshwater pearls only. 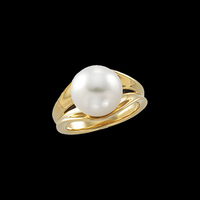 Greeks value the pearl as the symbol of love. This connotation of pearls has run throughout the world for centuries. During the Romantic era, maidens gave tokens with pearl gems to their favored knights in hopes that the gifts would help the knights win their battles. Promise a lifetime of love, faith, and completeness to your beloved with Gracious Rose pearl engagement rings. Gracious Rose offers high-quality handcrafted pearl engagement rings that will surely make your loved one melt. Supposedly, the oldest recorded wedding traces to 4,800 years ago in the Egyptian civilization. The circle, the shape of wedding rings, symbolizes the eternity of a never-ending bond. Meanwhile, the hole in the middle of the ring represents the grand openings that the bonded couple will share. Today, couples who love and cherish each other share precious jewelry that symbolizes their undying love. Having a pearl as the main gem of a wedding ring can elevate its meaning. Pearls symbolize purity and high regard for another person. It also represents faultlessness and entirety. Wedding rings matched with this gem represent the never-ending infinity of a love's pureness, enhancing the moments the two of you share. Give pure and undying love to your beloved with Gracious Rose pearl wedding rings. Gracious Rose provides you with over 3,500 exquisite designs to consider. You can also ask Gracious Rose's resident Jewelry Consultant to give you some advice on choosing the perfect ring for your special someone. Saltwater pearls – Usually found in Southeast Asia and some parts of Australia; collectively called "black pearls"
Black pearl rings ooze authenticity and glamour. 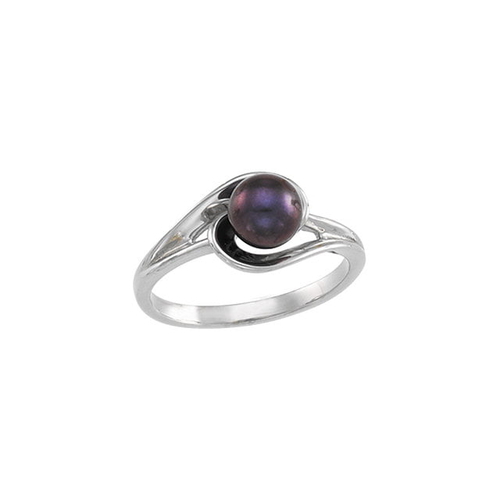 Give your beloved a one-of-a-kind jewelry piece from Gracious Rose's collection of elegant black pearl rings. The pearls from this renowned jewelry store come from only ethical sources, giving you peace of mind to go along with your elegant piece. Pearls represent the undying pureness of love and the seriousness of a person's intentions. It's the perfect gem for someone that owns your heart. Show your love for someone today; buy a Gracious Rose pearl ring. Shipping is free on orders over $250! Contact us now!